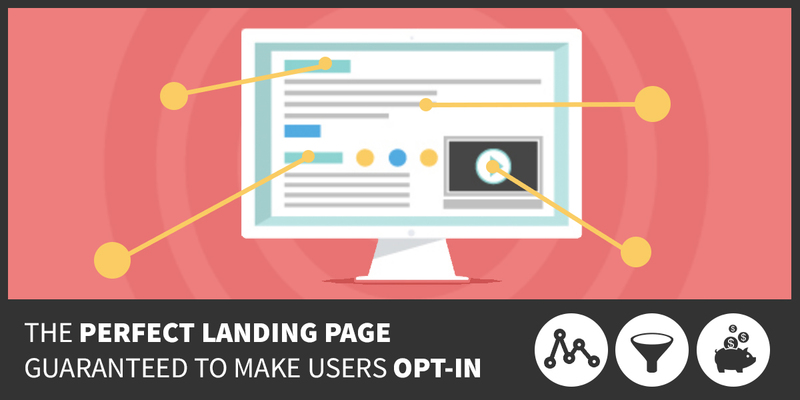 The first page users will see in your opt-in process is called your landing page. A landing page is just a special type of web page that we use to focus the user’s attention on our offer. A great landing page has two and only two outcomes – sign-up or go away. And that’s exactly how we want it. By putting everybody through a specific landing page, some additional benefits show up. It’s easier to log user sessions. It gives us higher conversion rates as opposed to sending traffic to a normal website page (less distraction for user’s attention). It makes it easy to split test for higher conversions. It makes it easier to calculate the ROI of your advertising campaigns. The great news about landing pages is, that as professional marketers, we’ve been using them for years. There is A LOT of data out there about split testing, what works and what doesn’t, so even though marketing isn’t 100% science, and what works for one industry doesn’t necessarily work for another, all of this data can be pulled together to give us what we call a “best practice”. After sending 100’s of thousands of users through hundreds of landing pages, we’ve come up with what we call The Perfect Landing page. The goal of our headline is to grab the user’s attention and get them to continue reading. 80% of people are going to read your headline, only 20% of people are going to read any other text on the page, so if the headline isn’t compelling or if it doesn’t grab their attention – the chances of somebody grabbing your lead magnet are slim. The purpose of the subhead is to clearly describe the benefit of your offer. The subhead supports or reinforces the headline. 3-5 bullet points are used to highlight the benefits of your product/service or call out your Unique Value Proposition (what separates you from your competition). Landing page images can be used to show your product, introduce the team, add human interest to the page or just point to your call to action button. These buttons tell the user what to do. Click here to Sign Up. Start My Free Trial. Download my Goodies. Call to action buttons should be large, easy to read and not require the user to scroll. Pictures and testimonials from previous users adds social proof and puts web visitors at ease and lets them feel like they’re making a smart decision. If it’s good enough for Jane, then it’s good enough for me. Awards won, showing the logos of high profile clients, “As seen on” or “Featured in” lists showing where you’ve been highlighted, are all great ways to build trust and credibility with your audience. These are relatively new because sales funnels, landing pages, and all the rest are really just not becoming “main stream”. But, there are more and more coming out every day. Pros: Integrated so there is presumably only one interface. Cons: To integrate you would be looking at a website redesign or if you don’t have a site, a new design based on one of these themes. In the grand scheme of things, this would be a relatively pricey and longer process so it may not be a good choice for you right now. Either you, your developer or your contractor can build the landing page in your website. Pros: Complete control over the look and feel. Cons: Developers that can hand code or do custom wordpress aren’t cheap and it is more difficult to make changes on the fly because you have to go through a developer. Pros: Pre-built templates, easily integrate with email autoresponders and can use for landing pages and thank you pages. Cons: Monthly fee. Personally I don’t like the monthly fee, but I do realize that is the way a lot of businesses are heading. The recurring revenue model makes a lot of sense for businesses, so I just make sure if I’m going to pay the recurring fee, I do it for a tool that I use. When using one of these 3 options and incorporating the 8 unique elements, your perfect landing page is guaranteed to make users opt-in. Use the comments section below and tell me if you have a landing page, and if so, how did you build it?